Remembering a special man, for a good cause. Having created the 1815 ‘Homage to Walter Lange’ to mark the life and times of the late spiritual father of A. Lange & Söhne, the German watchmaker has just revealed the one-off steel version will be sold for charity at auction in May. 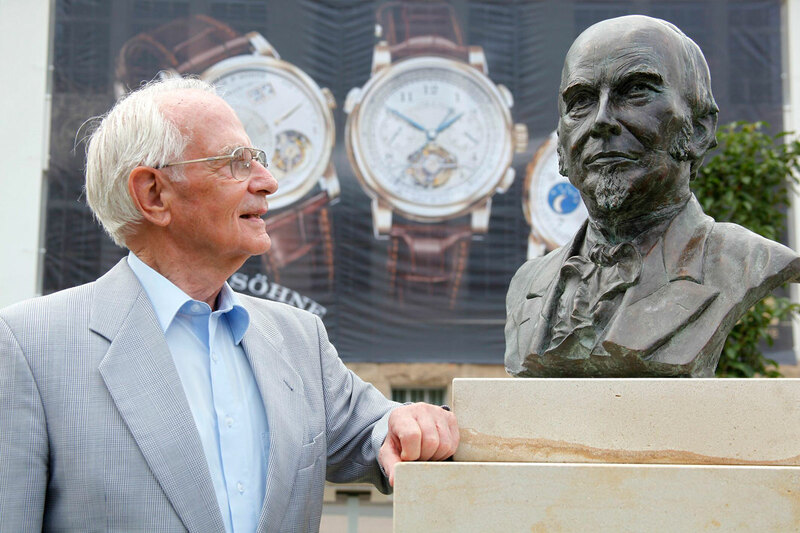 A direct descendant of brand founder Ferdinand Adolph Lange, Walter Lange passed away in January 2017 at the grand old age of 93, having lived to see his family’s watchmaking enterprise nationalised in the former East Germany and then resurrected in grand capitalist style, becoming arguably the preeminent watchmaker in Germany. The commemorative 1815 dead seconds is modelled on 19th century Lange pocket watches with the same complication, a favourite of Walter Lange and one that was invented by F.A. Lange himself. The watch has twin seconds hands: a conventional sweeping seconds hand in the centre, along with a jumping dead seconds in the sub-dial at six o’clock. 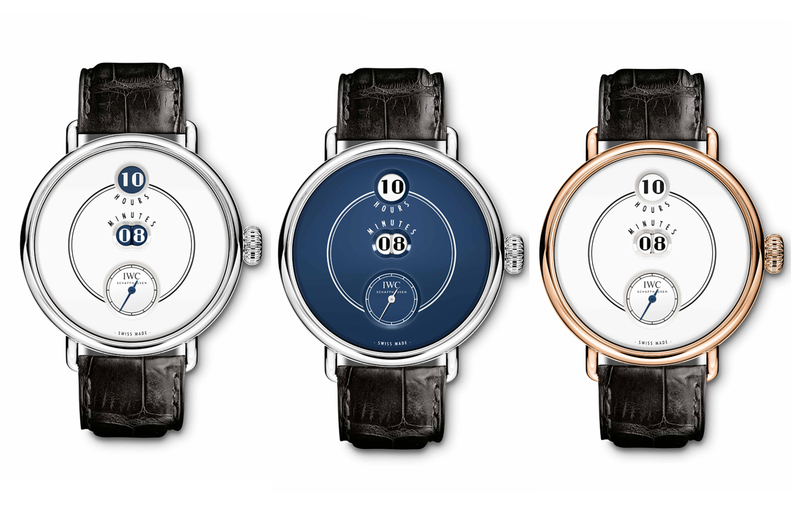 Three versions of the 1815 will be commercially available as a limited edition, in each of the colours of gold and fitted with the same silver dial. 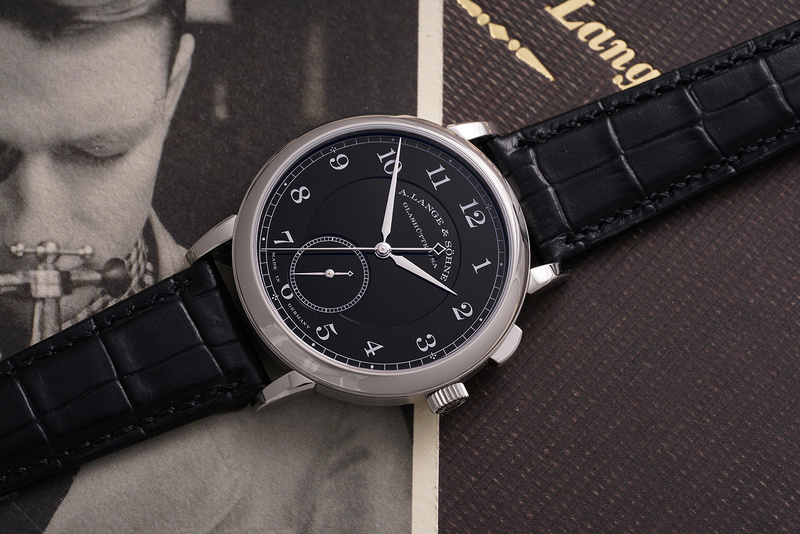 In contrast the Walter Lange watch boasts a black fired enamel dial (made in-house now). And the singular watch will join the handful of Lange watches ever produced in the metal, joining the stainless steel Double Split that remains the most expensive Lange watch ever sold at auction when it sold for just over US$500,000 in 2013. Having all of the world’s most expensive watches at auction in the last three years – including the US$17.5m Paul Newman Daytona – Phillips auctioneers has been tapped by Lange to sell the unique 1815. It will be offered in the spring sale that takes place in Geneva on May 13, 2018, the day after the Daytona Ultimatum thematic auction. The estimate for the 1815 ‘Homage to Walter Lange’ is upon request. 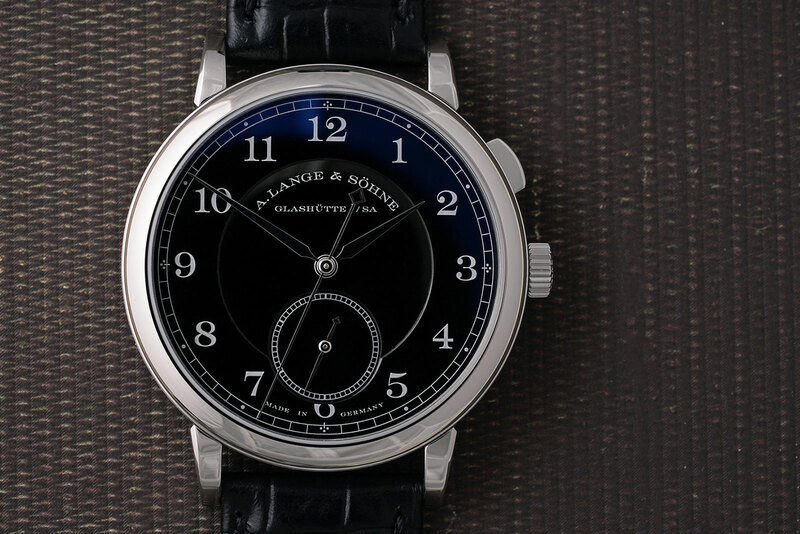 Given the US$500,000 achieved by the Double Split and the US$150,000 or so steel Lange 1s typically sell for, the one-off 1815 might sell for US$300,000 to US$400,000. All proceeds from the auction will go to Children Action, a Geneva-based charity that helps disadvantaged children in Switzerland and elsewhere in the world, a cause close to Walter Lange’s heart. For more visit Phillips Watches. Breaking the record by a large, large margin. Newman's very own Rolex ref. 6239 watch to be offered by Phillips come October 2017. 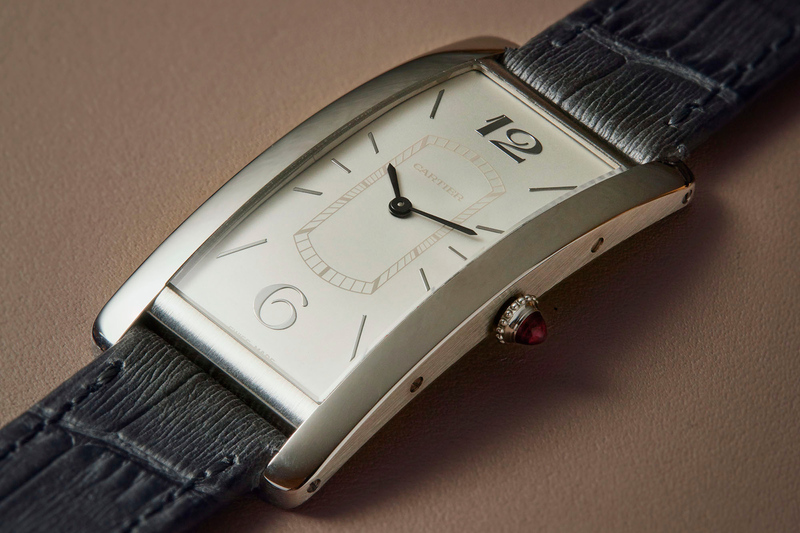 With a chief executive who has publicly declared Cartier is returning to its classic styles, the jeweller’s SIHH 2018 line-up was expected to be, well, classical. The resurrected Tank Cintrée is nonetheless a surprise, being a design that harks back to the origins of the Tank, yet isn’t quite a vintage remake. 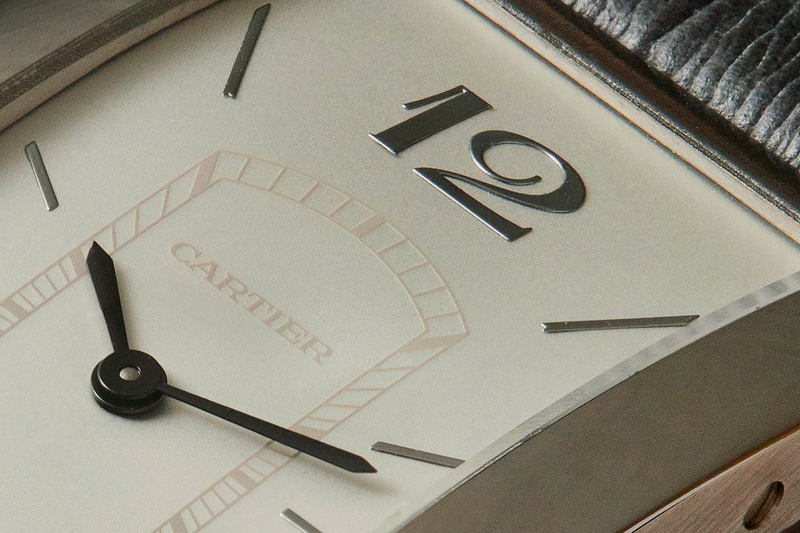 One of the few amongst dozens of Cartier Tank variations produced only in limited edition runs – including the 2006 remake of 150 in yellow gold and 50 in platinum that’s the closest to this one – the Tank Cintree is like the elegant Francophile sibling to the heavyset, but more widely known, Tank Americaine. Designed in 1921 as one of the earliest variations of the original Tank, the Cintrée translates literally as “curved Tank”, a nod to its gently arched case. Sized exactly the same as the largest vintage Tank Cintree (and also the 2006 reissue), the latest edition is 46.3mm long, just 23mm wide and only 7.6mm high. It’s a slender but still substantial form, and striking on the wrist because of the shape. The Tank Cintrée is available in three guises: yellow gold with a champagne dial, pink gold with a black dial, and platinum with a pale grey dial. All share the same dial design that’s familiar, but still relatively novel. It draws heavily on vintage Tank Cintree watches, featuring the same railway track and Arabics at 12 and six, but with baton indices for the rest of the hours. Like the original Tank watches, the dials have a smooth, as opposed to guilloche, finish. Though rather than grained surface, they have a radial brushed finish that is fine enough to be almost imperceptible, especially on the platinum version. Each version is subtly differentiated in an elegant manner. The champagne dial features brown markings and blued, while the platinum model has a ruby cabochon on the crown, historically a feature of platinum Cartier watches. Of the three the platinum version is the clear winner, starting with its tactile feel. The denser metal gives it a bit more heft, which helps given that the watch is quite insubstantial. The monochromatic grey dial and black hands also give it a dignified bearing, but one that is alleviated by the bright red crown jewel. And best of all it is only 15% or so more than the gold models. Between the two versions in 18k gold, the yellow gold Cintree is more unusual, and also more attractive. The colours give it a vaguely vintage feel without feeling affected, though the yellow tones of the watch lack contrast with Asian skin. The Tank Cintrée is powered by the cal. 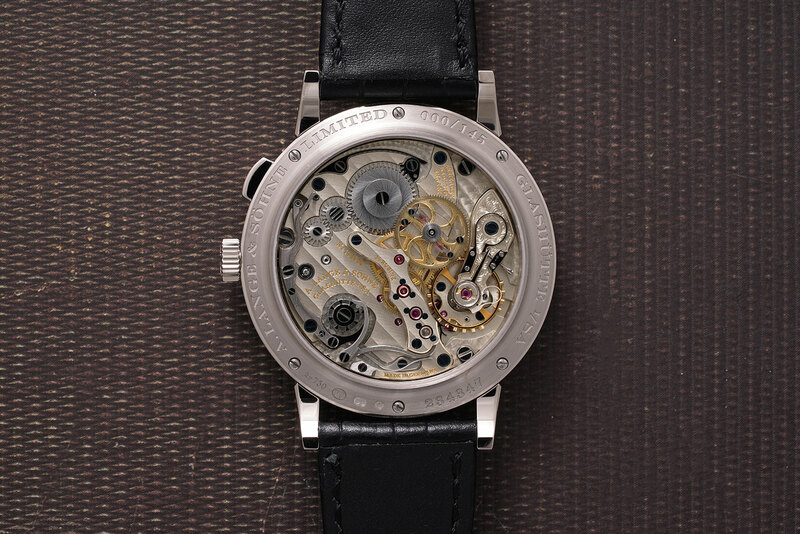 8971 MC, which is actually a Jaeger-LeCoultre cal. 846. Ovoid in shape with a 36-hour power reserve, the cal. 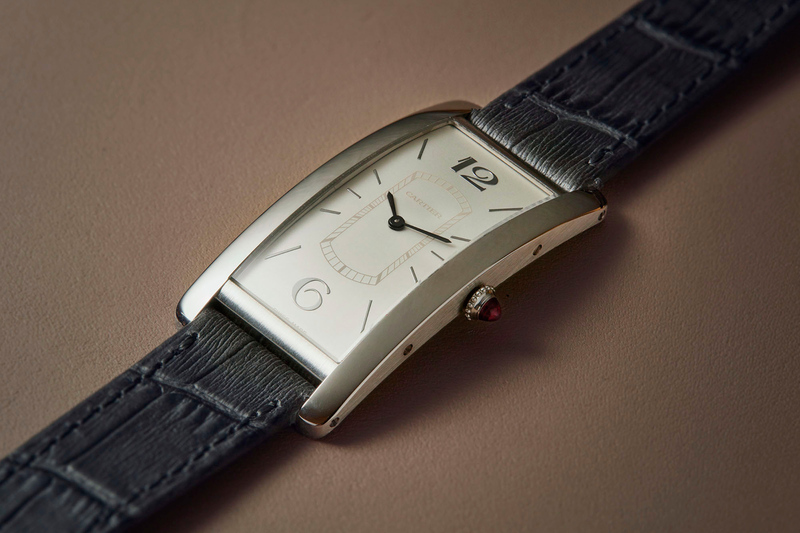 846 is a smallish movement developed for the small and medium size Reverso watches. All three are paired with matching alligator straps that notably have pin, or ardillon, buckles, instead of the folding clasp synonymous with Cartier. That’s one factor that kept the retail price reasonable, though it leaves the watch feeling a little incomplete, given that the folding clasp is practically standard issue for Cartier. The Tank Cintrée in yellow or red gold is part of the regular collection, and priced at €16,500. The same in platinum is a limited edition of 100, with a price of €19,000. All prices exclude taxes. The trio will be available at Cartier retailers and boutiques sometime in the later half of 2018. 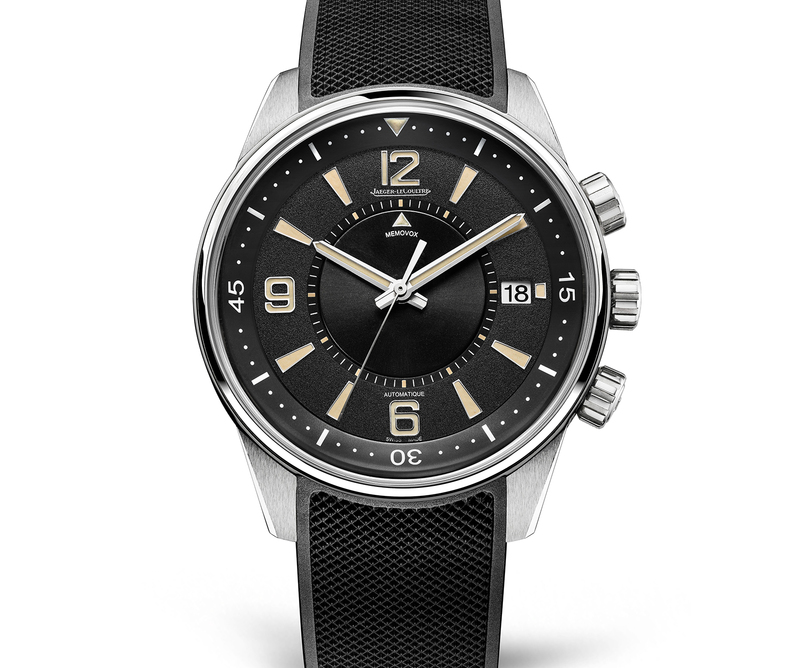 Jaeger-LeCoultre has just unveiled a full range of watches inspired by the Memovox Polaris E859, the 1968 diver’s alarm that is now 50 years old. One of the most valuable vintage Jaeger-LeCoultre watches, the Polaris had a brief run with only 1714 ever made. 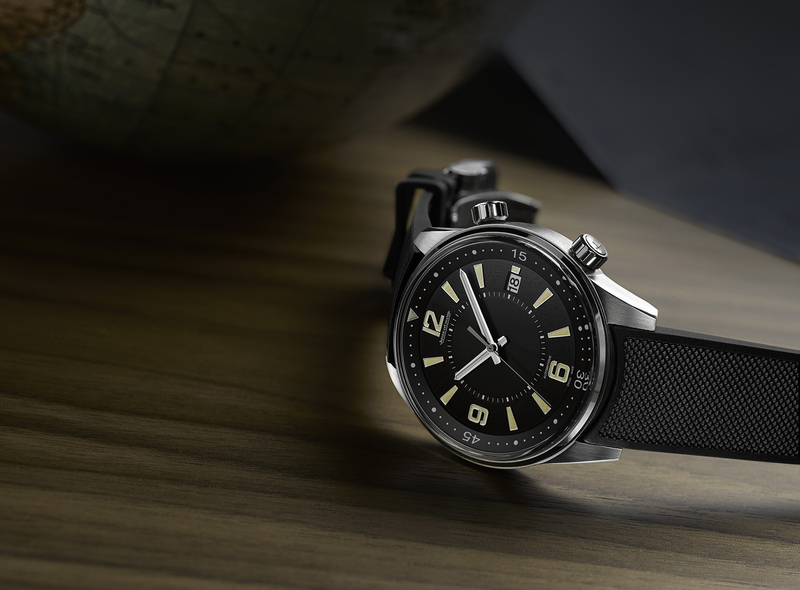 Now it has been has been repurposed into an entire range of watches for land and air, made up of five models from a three-hand automatic to another (yet another) remake of the original Polaris Memovox. Unifying elements across the collection include a dial with three types of surface finishing (frosted, brushed and satin); Super-Luminova applied hour markers; and short, faceted lugs. The Polaris Automatic features a dual crown system, with one to set the time and the other to turn the inner elapsed time bezel. Available with either a black or metallic blue dial, it measures 41mm in diameter and is powered by the cal. 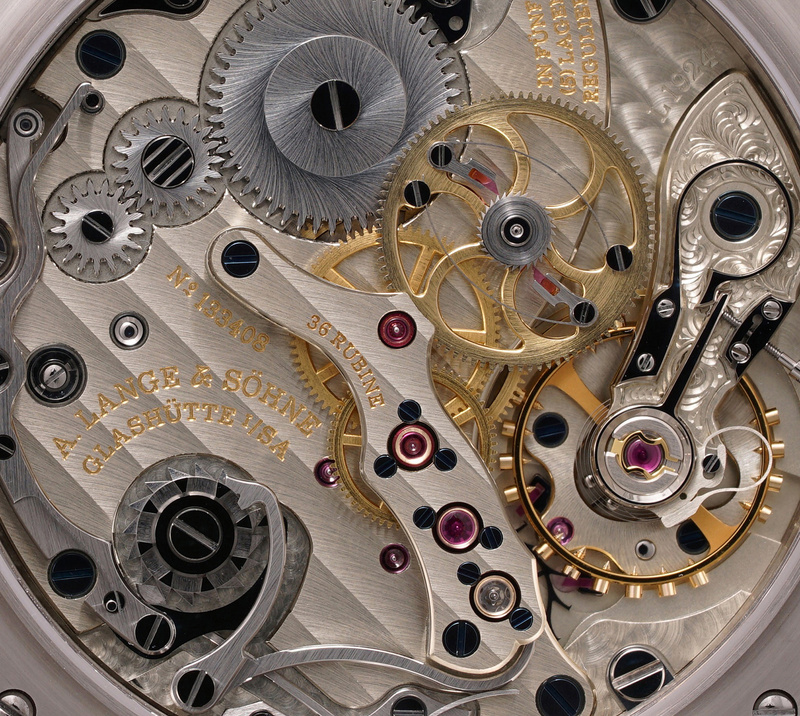 898/1, the same movement that powers the Jaeger-LeCoultre Geophysic 1958. It costs US$6,600 on a calf leather strap, US$6,900 on an alligator strap, and US$7,600 on the stainless steel bracelet. The biggest departure from the diver’s watch in the collection is undoubtedly the Polaris Chronograph, which is the driver’s chronograph cousin of a diving alarm. Measuring 42mm in diameter, it has a bi-compax layout with a tachymeter scale. The movement inside is the column wheel-quipped cal. 751. Unlike the other Polaris models, it is available in both rose gold and steel. The stainless steel model on a calf strap is US$10,000, while on an alligator strap it’s US$10,100. And on a steel bracelet the price is $10,900, with the 18k rose gold model being US$24,500. The most complicated piece in the collection, the Polaris Chronograph World Time, combines a chronograph and world time function. The case was expanded to 44mm to accommodate the various indicators on the dial. While large it is also considerably lightweight, being made of titanium and relatively slim at less than 13mm high. This is priced at US$14,500 on a calfskin strap and US$14,600 on an alligator strap. The Polaris Date resembles the vintage alarm but isn’t one, instead it is a time-only watch with a date display at three o’clock like the original Polaris. 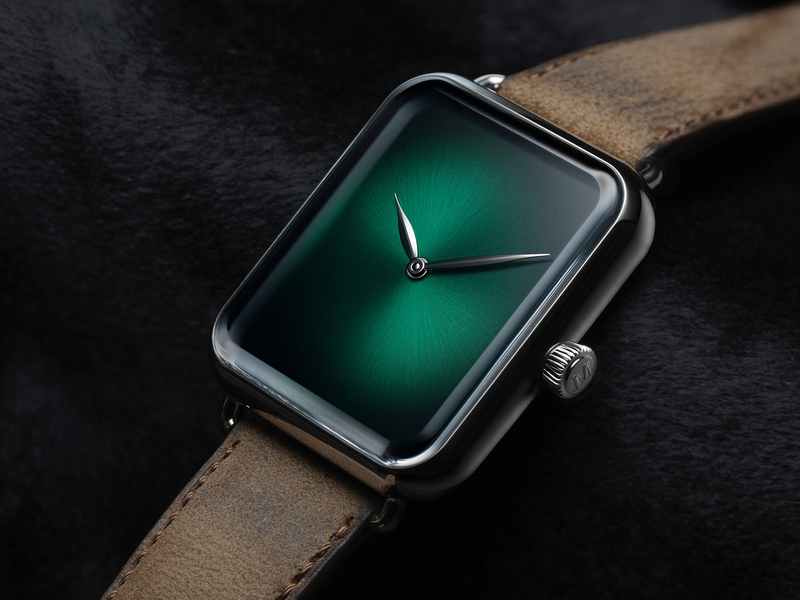 It inherits all attributes of the 1968 original including dual crowns, an inner bezel, trapezoidal indices, a railway track for the minutes, a box-type crystal as well as beige lume to mimic aged tritium. The case is the same 42mm as the vintage Polaris was, while its solid caseback features an engraving of a diver. The Polaris Date is priced at US$7,750 on a rubber strap and US$8,700 on the stainless steel bracelet. 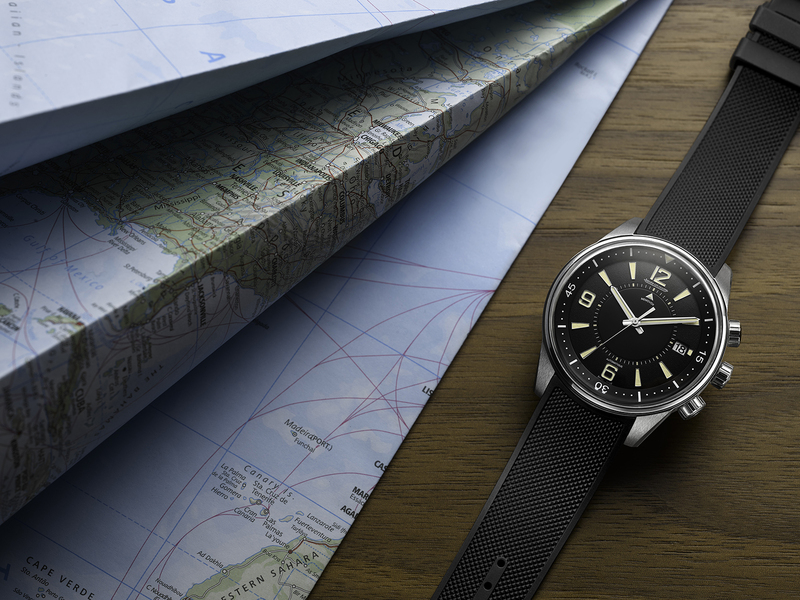 The 50th anniversary limited edition is the Polaris Memovox. Drawing heavily on the original but not an out and out remake, it keeps the triple crown and the triangular alarm indicator, but is a distinctly modern creation with its wide hands and chunky case. The departure from the original design is a good move, for Jaeger-LeCoultre already produced three variations of the Polaris remake in 2008. Like the Polaris Date, it has faux vintage lume, as well as a 42mm case that’s rated to 200m. It features the cal. 956 automatic alarm movement, which is used in all modern Jaeger-LeCoultre alarm watches. The Polaris Memovox is limited to 1,000 pieces and costs US$12,600. The provocative Swiss Icons Watch may have been rescinded, but Moser’s subtle dig at the Apple Watch has been iterated in various incarnations from the Swiss Alp Watch Zzzz to the Swiss Alp Watch S. Launched in 2015 as a limited edition, the watch was a gentle jab at Apple’s smartwatch just as the Swiss watch industry was starting to worry about its future. The Swiss Alp Concept Watch is white gold and features Moser’s distinctive “cosmic green” dial with a graduated finish that darkens towards its edges. Just like the Apple Watch, the watch has a rectangular case with rounded corners, and being a Moser “Concept” watch, the dial is index-free. Inside beats the hand-wound cal. HMC 324, the brand’s top tier time-only movement that has a four-day power reserve as well as a Straumann hairspring and an interchangeable escapement. The escapement also has the pallet fork and escape wheel made of solid gold. 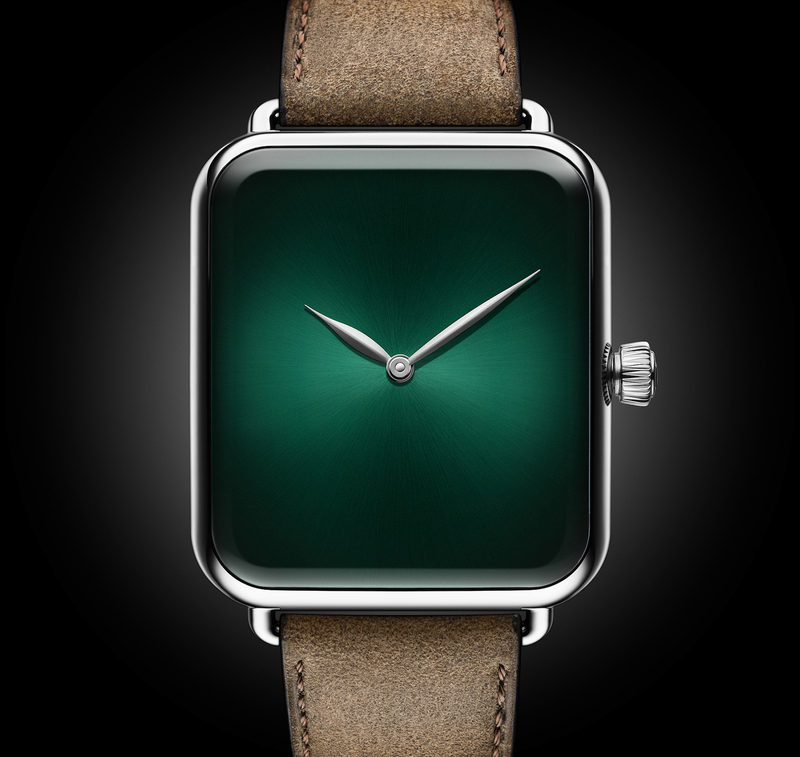 The Swiss Alp Watch Concept Cosmic Green (ref. 5324-0210) is priced at SFr26,900 and is a limited edition of 20 pieces. Something for everyone in the 27-strong line-up. 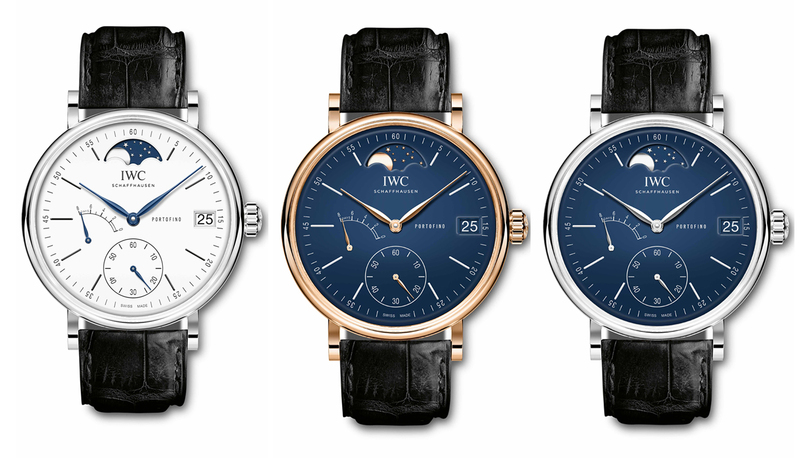 To celebrate the 150 years since its founding in 1868, IWC has put together the 150th Anniversary Jubilee Collection: 27 watches encompassing all of the brand’s bestselling model lines. 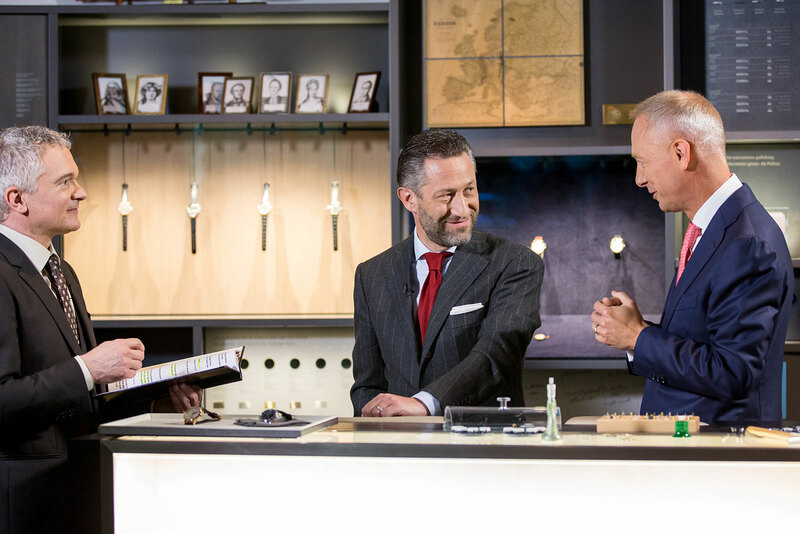 The collection spans a diversity of watches, with the base models starting at US$5000, but also includes the digital Pallweber pocket watch. Varied as they are, all the Jubilee watches share several key traits. The dials are either white or blue lacquer that’s smooth and glossy, meant to resemble fired enamel. For that reason, the anniversary watches also have printed, rather than applied, hour markers. And all Jubilee watches have case backs or movements bearing the anniversary insignia. The most unusual is undoubtedly the Tribute to Pallweber Edition “150 Years” (Ref. 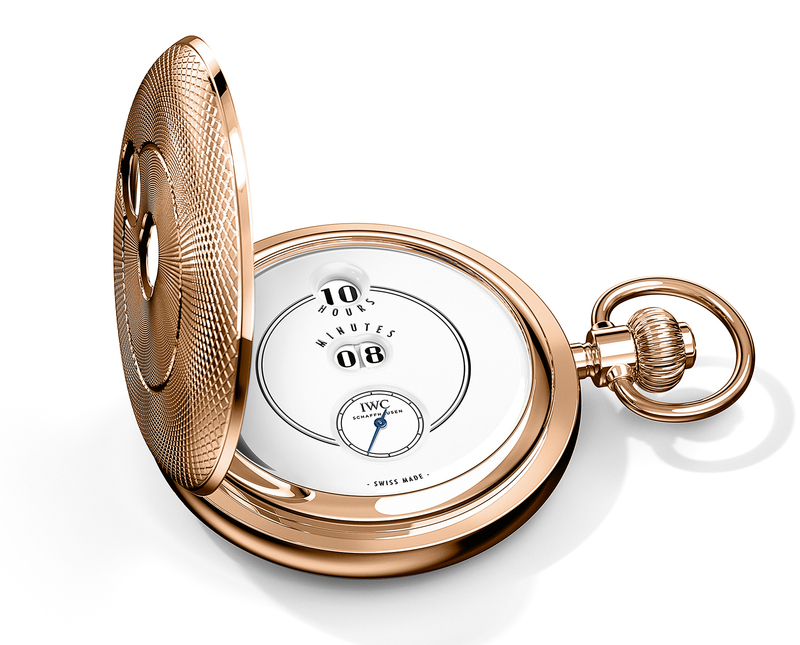 IW505101), a pocket watch modelled on the late 19th century original made by Austrian watchmaker Josef Pallweber. 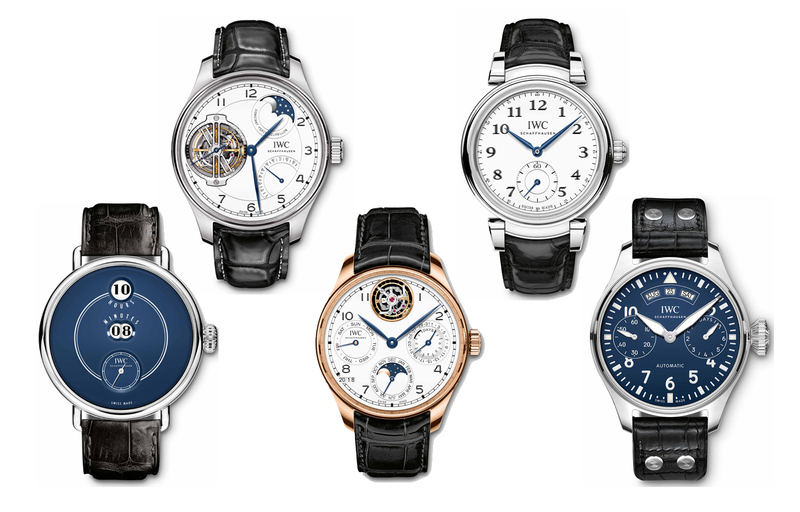 While IWC produced pocket watches until recently, discontinuing them only about a decade ago, they were absent in its catalogue, until now. Very much like the original, the modern day Pallweber tells the time via jumping hours and minutes, plus a running small seconds at six o’clock. It has a 52mm red gold case with an engine-turned hinged cover and a white lacquer dial. Inside is the cal. 94200, which has a separate barrel and wheel train for the minute discs, giving it 60 hours of power reserve. The price has yet to be revealed. Just as different as the pocket watch but much more practical, the Tribute to Pallweber Edition “150 Years” was unveiled in red gold just before SIHH 2018 to a notably warm response, especially from aficionados. 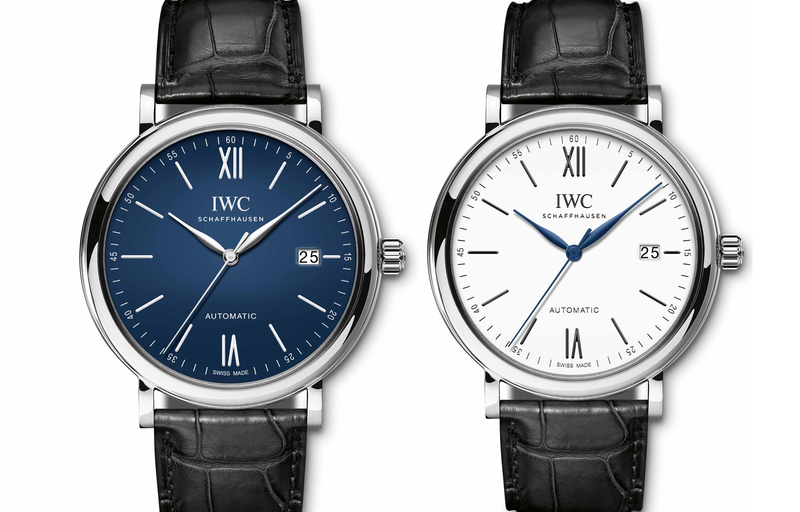 Two more versions have just been announced: platinum with a white lacquer dial (ref. 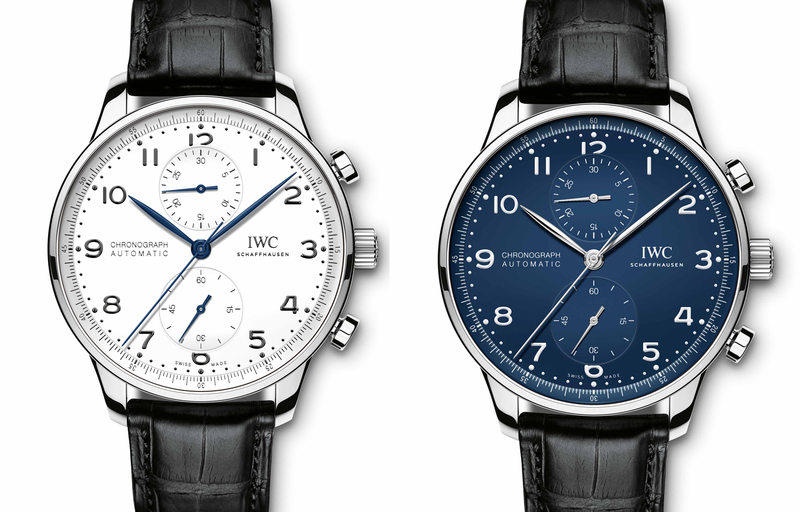 IW505001) as well as stainless steel with a blue lacquer dial (ref. IW505003). They measure 45mm in diameter and are powered by the same cal. 94200. Limited to 500 in steel, 250 in red gold and just 25 in platinum, the Pallweber wristwatch takes after the original IWC digital display pocket watch, offering the most novel movement and time display from IWC in a very long time. The steel Pallweber will cost SFr24,000, while the platinum version is SFr60,000. And just in-between, the red gold is SFr38,000. The flagship model of the Jubilee Collection, the Portugieser Constant-Force Tourbillon Edition “150 Years” features a constant force mechanism integrated into the regulator, as well as a silicon pallet fork and escape wheel. Usually the constant force mechanism also turns the tourbillon cage into a deadbeat seconds hand, leaving it to move in one-second steps for the first half of its power reserve. Past the first 48 hours, the constant force then disengages and the tourbillon rotates smoothly, because there is insufficient energy to keep the constant force wound. It’s available only in platinum with a 45mm diameter, with the choice of a white lacquer dial and blued hands (ref. 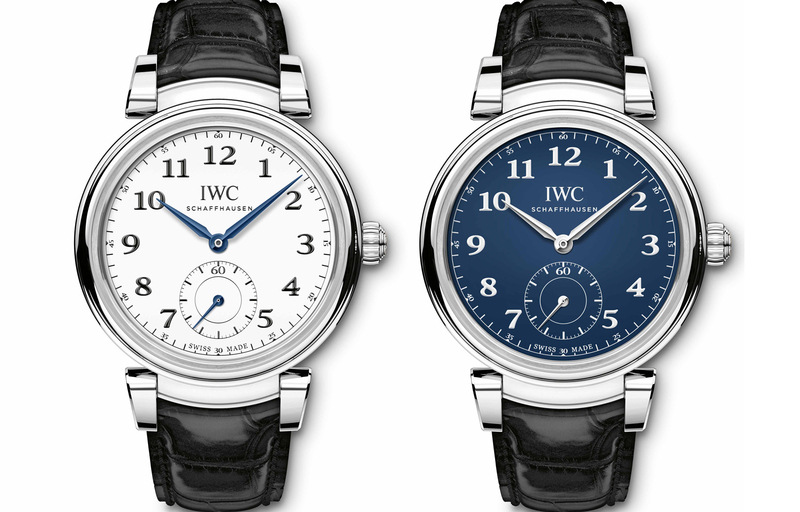 IW590202), or blue lacquer dial and rhodium-plated hands (ref. IW590203). Limited to 15 pieces in each colour, this will cost SFr255,000. Available only in red gold with a white lacquer dial, the Portugieser Perpetual Calendar Tourbillon Edition “150 Years” (ref. IW504501) is powered by the newly developed cal. 51950. It’s essentially the first generation seven-day cal. 5000 with the addition of a compact flying tourbillon that’s visible at 12 o’clock. Limited to 50 pieces, this will cost SFr110,000. 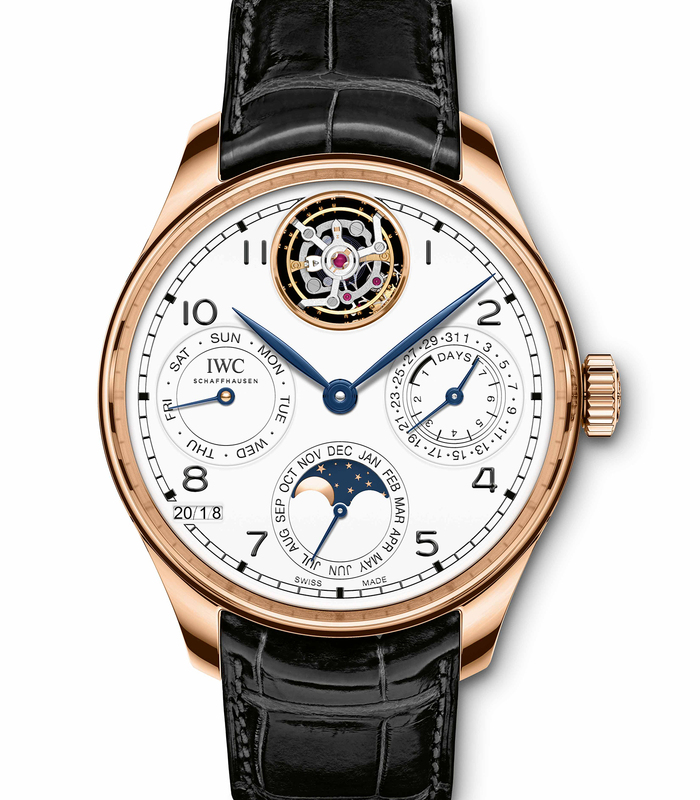 For those unable to stomach a tourbillon, the Portugieser Perpetual Calendar Edition “150 Years” (ref. IW503405) has everything but the tourbillon. 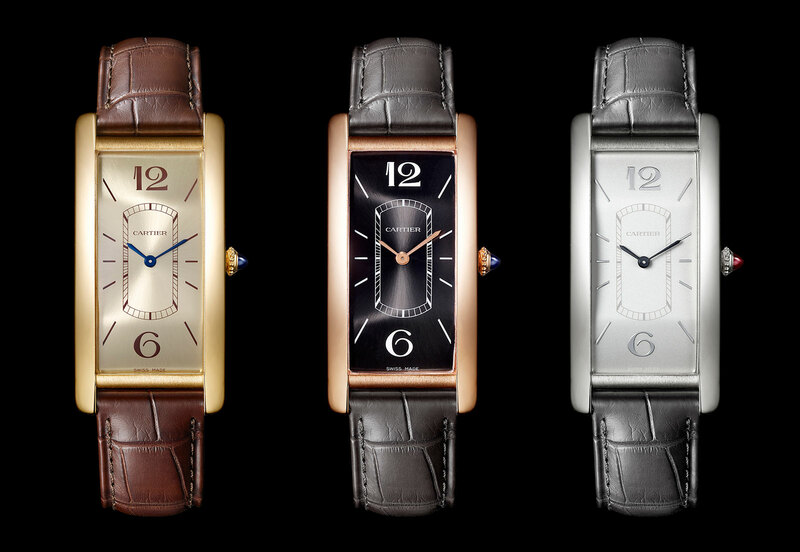 Also only available in red gold with a white lacquer dial and blued hands, it is powered by the cal. 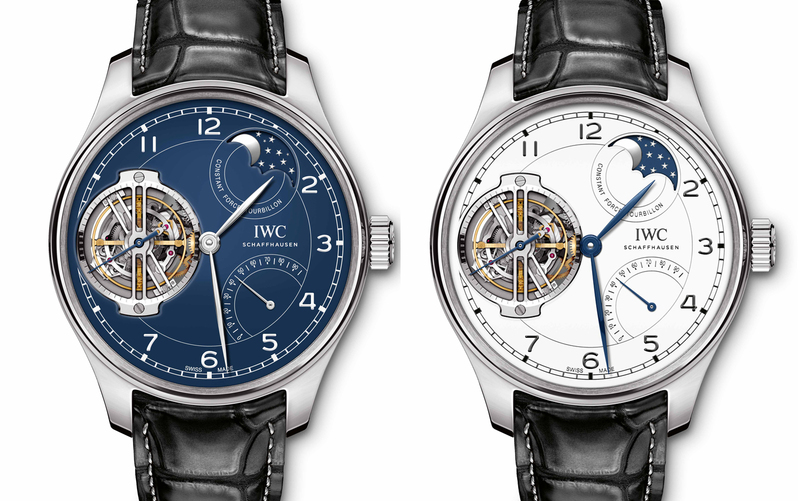 52615, a variant of IWC’s second generation seven-day movement. Limited to 250 watches, this will cost SFr40,200. Likely to the be one of the most popular watches in the range since it is essentially an upgrade of a perennial favourite, the Portugieser Chronograph Edition “150 Years” looks just like the current model powered by a Valjoux (or sometimes Sellita) movement. But the Jubilee model is instead equipped with the in-house cal. 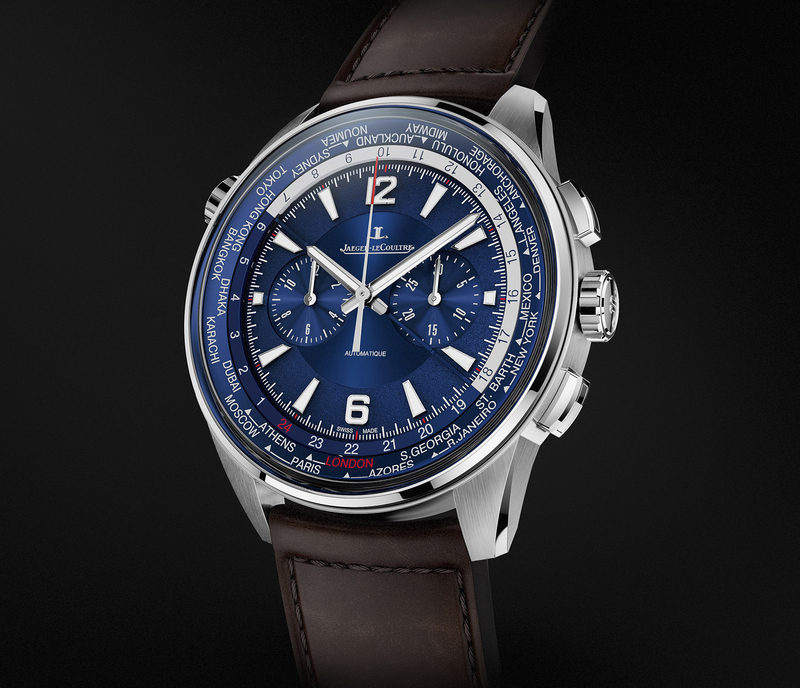 69355, the first time the Portugieser Chronograph has gone upmarket. 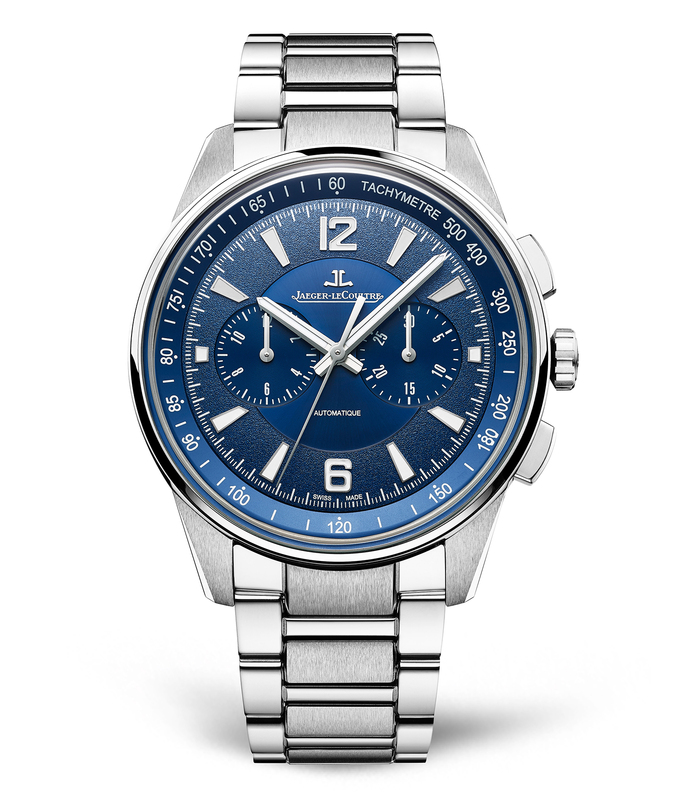 Available in stainless steel with a blue lacquer dial and rhodium-plated hands (ref. IW371601), or white lacquer dial with blued hands (ref. IW371602), this is limited to 2000 watches in each colour. Both are priced at SFr8100. The Portugieser Hand-Wound Eight Days Edition “150 Years” is available in red gold (ref. IW510211) or stainless steel (ref. 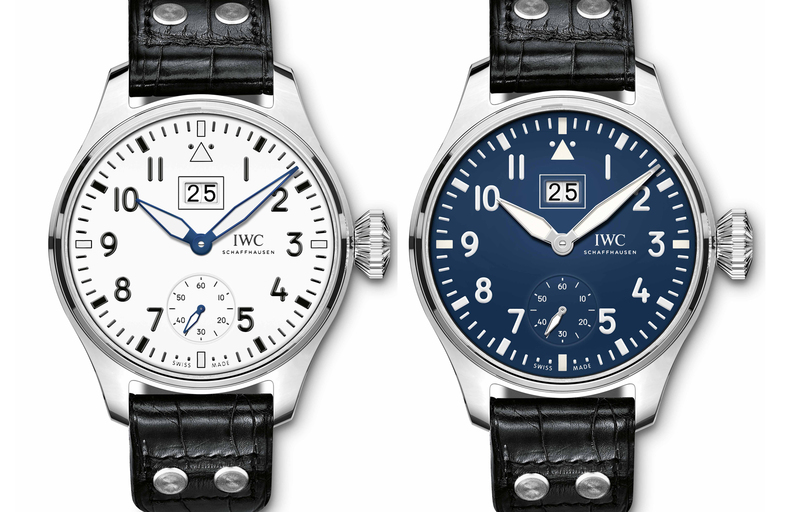 IW510212), both with white dials featuring a railway minute track and blued steel hands. 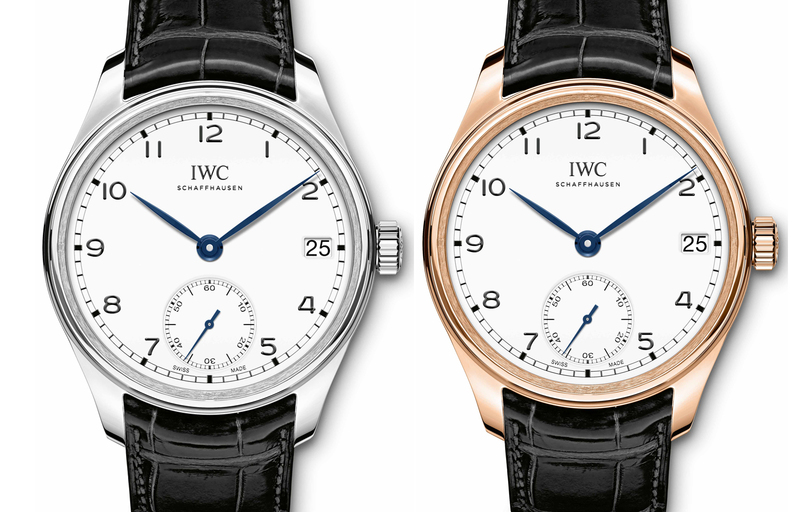 Forty three millimetres in diameter like the first Portuguese models of the 1930s, the Jubilee model is still distinctly contemporary given the date window and modern IWC logo. It is powered by the hand-wound cal. 59215, which has an 8-day power reserve that’s indicated on the back. The red gold model is a limited edition of 250 watches priced at SFr18,900, while the stainless steel is a limited edition of 1,000 that’ll cost SFr9900. 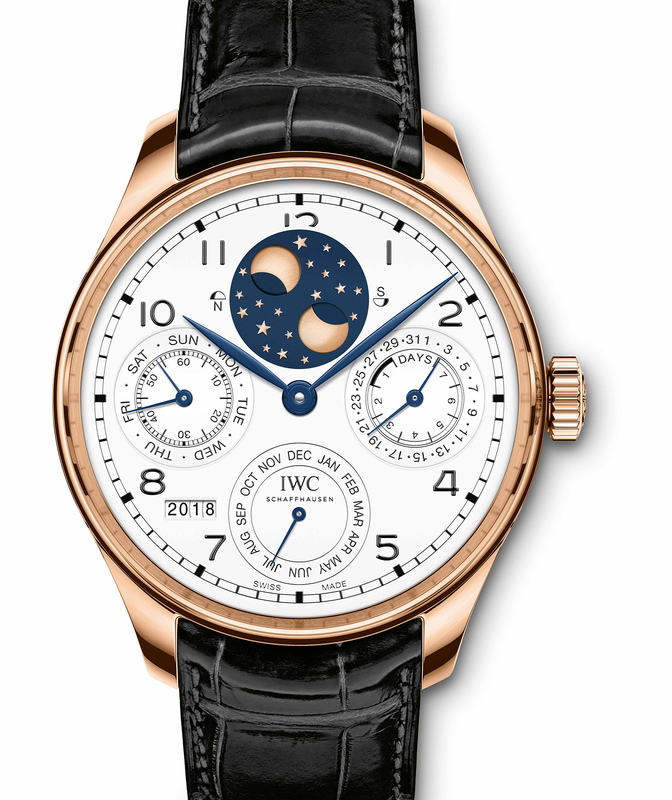 The Portofino Hand-Wound Moon Phase Edition “150 Years” is available in red gold with a blue lacquer dial (ref. 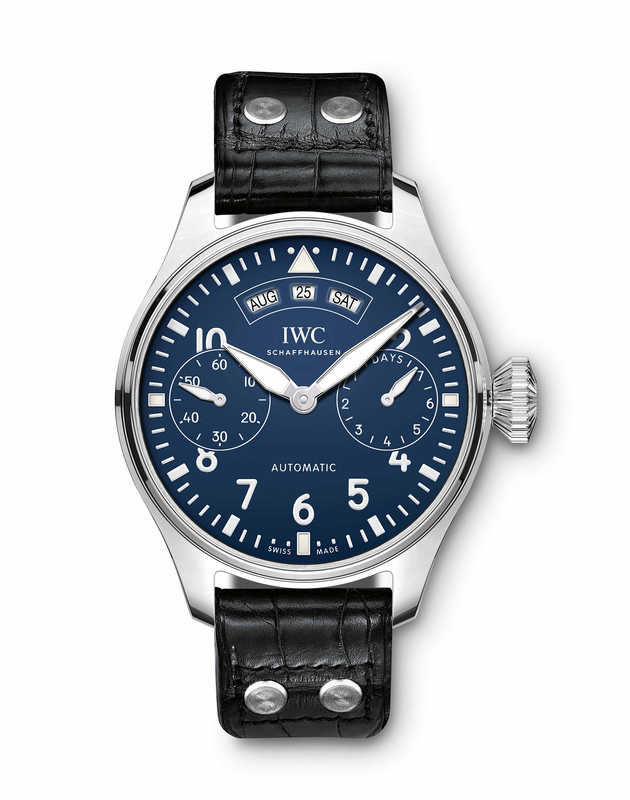 IW516407), stainless steel with a blue lacquer dial (ref. IW516405) or stainless steel with a white lacquer dial (ref. IW516406). 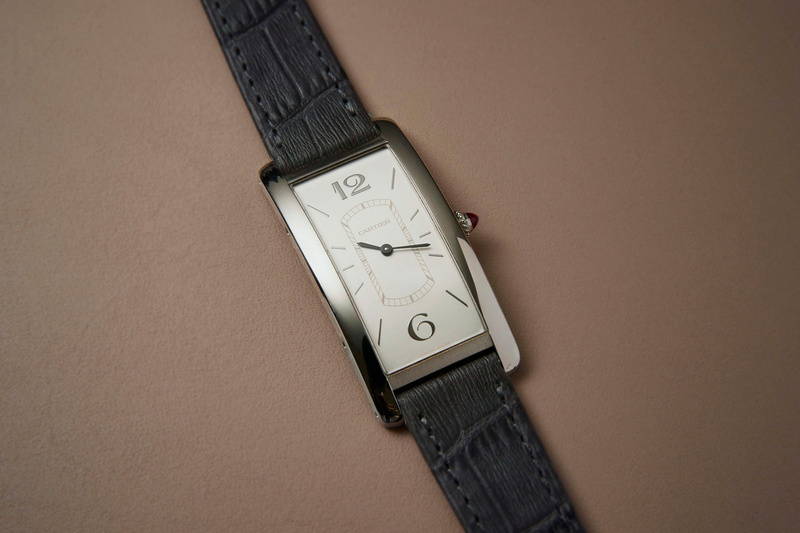 The case is 45mm and contains the hand-wound cal. 59800 that has an eight-day power reserve. Limited to 350 pieces each, the steel models are SFr13,400, while the red gold is limited to 150 pieces and priced at SFr23,700. Another crowd favourite will be the Portofino Chronograph Edition “150 Years”, which is the entry-level chronograph in the Jubilee Collection. 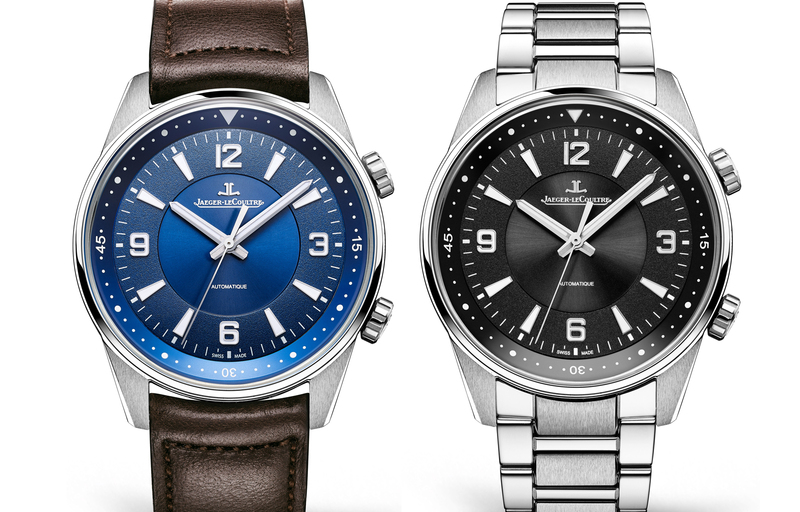 Available either in stainless steel with a blue lacquer dial (ref. 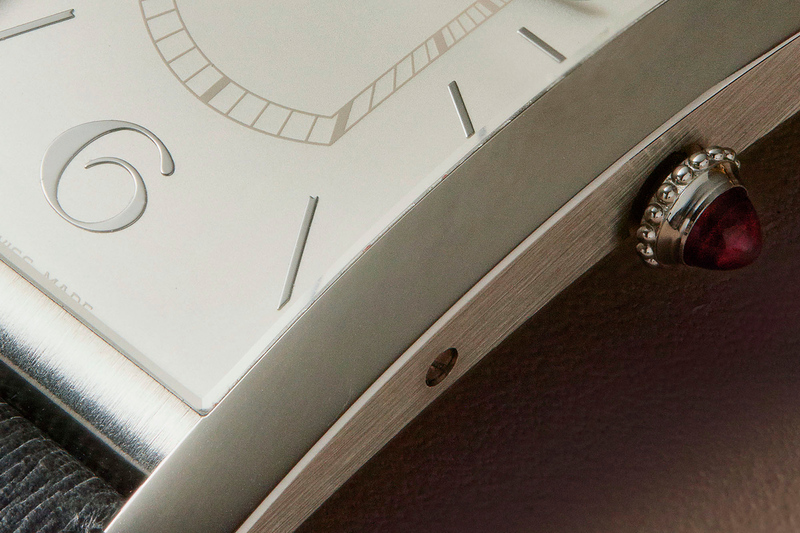 IW391023), or a white lacquer dial (ref. IW391024), this is powered by the cal. 79320, which is either a Valjoux 7750 or the identical Sellita SW500. Each is a limited edition of 2,000 pieces, priced the same at SFr5900. Positioned as the entry-level men’s Jubilee watch, the Portofino Automatic Edition “150 Years” is 40mm in diameter, showing the time and date. 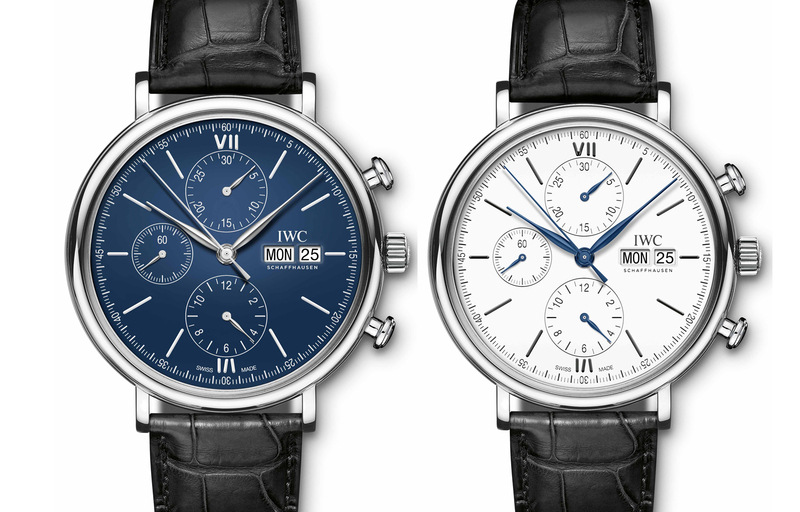 It is offered with either a blue lacquer dial (ref. 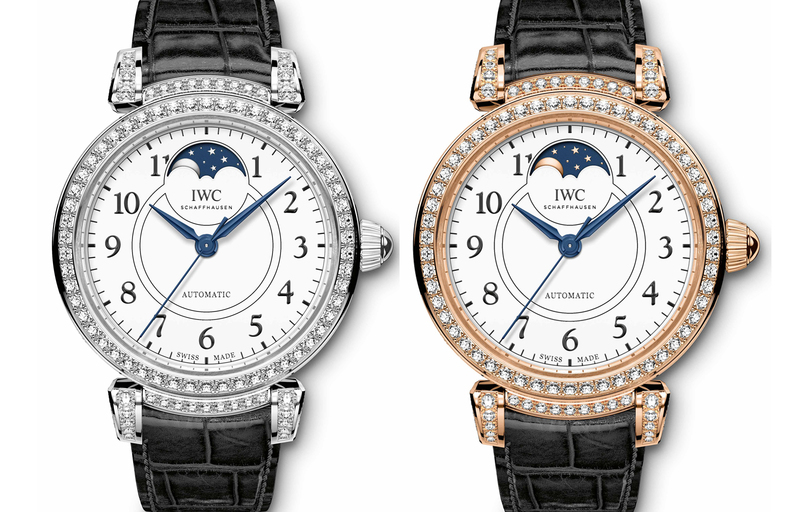 IW356518) or a white lacquer dial (ref. IW356519), each limited to 2,000 watches. Similarly it is powered by either an ETA or Sellita movement, explaining the price: SFr4700. Limited to 100 pieces, the Big Pilot’s Watch Annual Calendar Edition “150 Years” (Ref. IW502708) is standard Big Pilot size, 46mm in diameter, and stainless steel. The dial is blue lacquer with rhodium-plated hands, a colour combination that’s reminiscent of early platinum Big Pilots. As with stock models, it displays the calendar in the American format of month, date and day, and is powered by a seven-day cal. 52850. It’s limited to 100 pieces, priced at SFr20,200. Unusually the Big Pilot’s Watch Big Date Edition “150 Years” features an entirely new movement, being the first pilot’s watch to feature a big date. A big date display was added to the seven-day cal. 59210 and the power reserve was relegated to the back of the watch so as to maintain the characteristically clean and functional pilot’s dial. It comes in two stainless steel iterations, with either a blue (ref. IW510503) or white lacquer dial (ref. IW510504), each limited to 100 pieces. Each is SFr14,900. 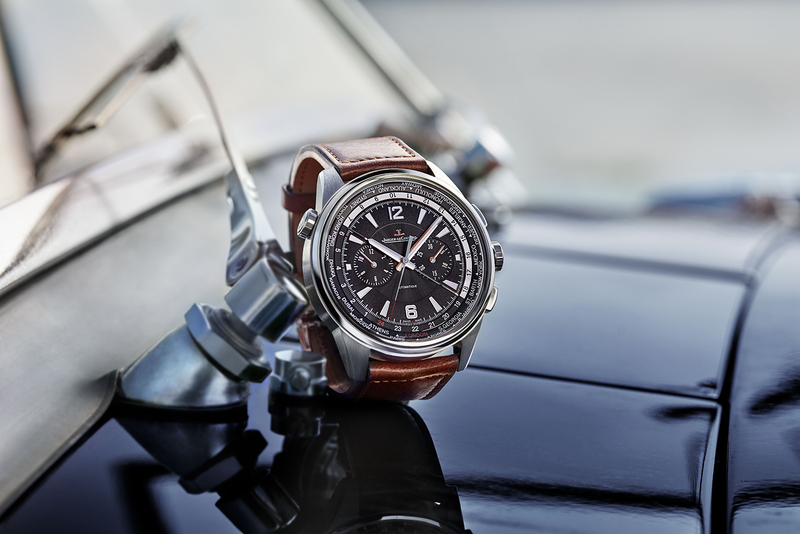 The entry-level aviator’s watch is the Pilot’s Watch Chronograph Edition “150 Years” (ref. IW377725). The dial is white lacquer, matched with blued hands and an entirely polished case, a combination the gives it a flashier look than the average pilot’s timepiece. It’s powered by the Valjoux 7750 or its Sellita clone. 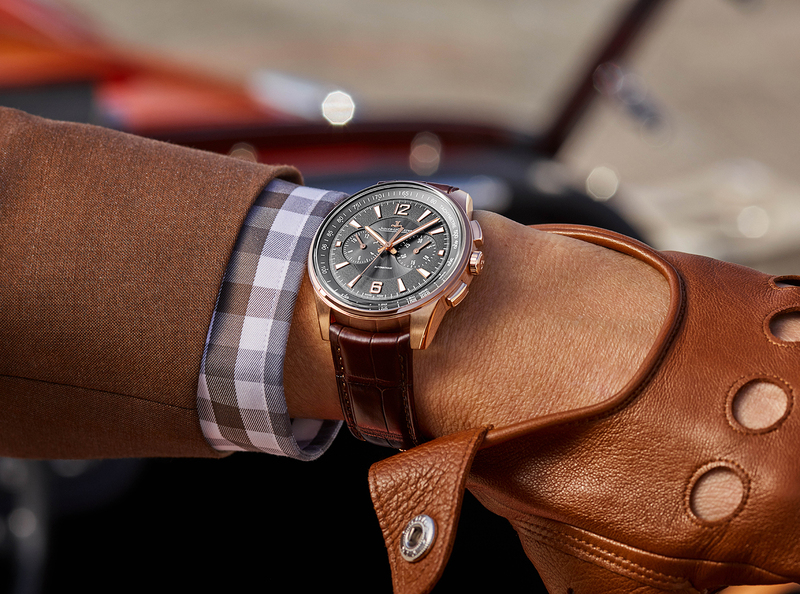 Limited to 1,000 watches, the chronograph has a 43mm case. The price is SFr5600. 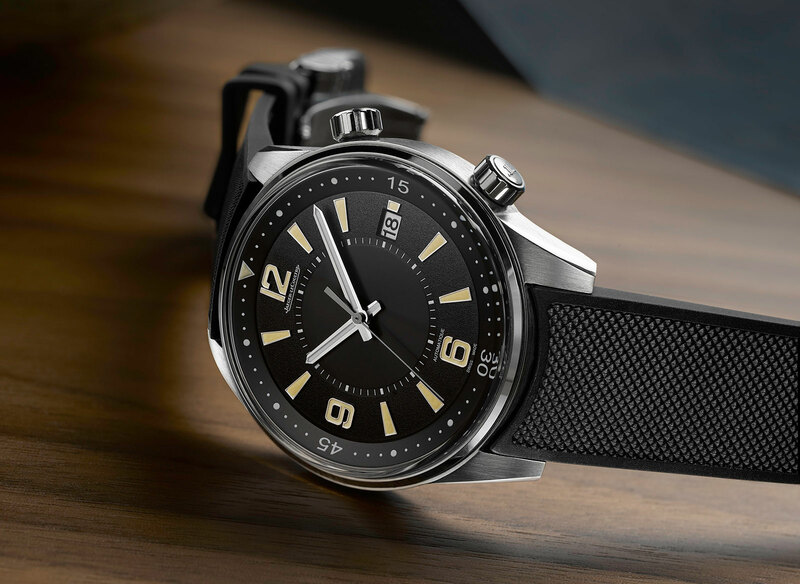 The Da Vinci Automatic Edition “150 Years” is 40mm and features a brand new calibre, the 82200 that was conceived to be the affordable (and smaller) option for IWC’s in-house movement. Nevertheless it features a Pellaton winding system with ceramic pawls and wheels, as well as a 60-hour power reserve. It is available in red gold with a white dial (ref. IW358103), priced at SFr18,900. Or in stainless steel with either a blue (ref. 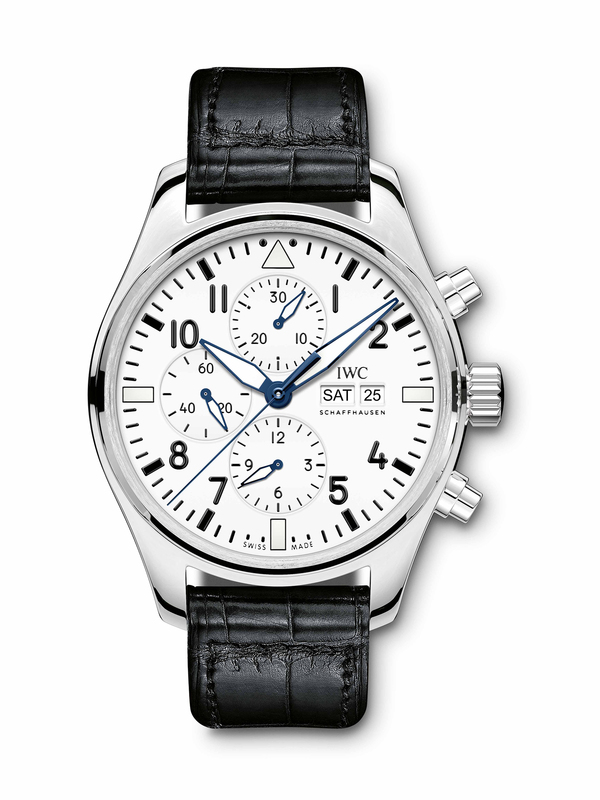 IW358101) or white dial (ref. IW358102), costing SFr9900. A total of 250 watches will be made in red gold and 500 in each colour for the stainless steel version. Measuring 36mm in diameter, the Da Vinci Automatic Moon Phase 36 Edition “150 Years” is swathed in 206 brilliant-cut diamonds on the bezel and lugs. It features a moon phase display at 12 o’clock and is powered by the cal. 35800, which is a modified Sellita SW300. It’s available in 18k red or white gold, each limited to 50 pieces. The red gold version costs SFr31,000, while the white gold is slightly more, or SFr32,000. Marvel's web slinger superhero on the RJ x Spider-Man. RJ Romain Jerome’s fondness for pop culture icons knows no boundaries, with the brand having produced watches featuring Batman, Super Mario Bros, and even Hello Kitty. 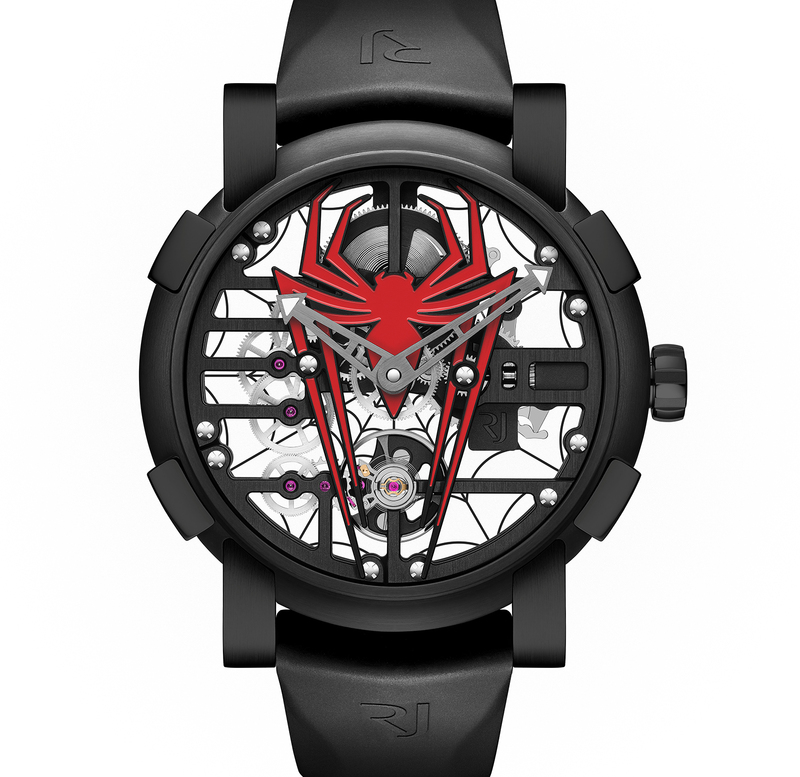 And at SIHH 2018 Romain Jerome continues its appeal to well-off fanboys and girls, having just rolled out the first Marvel comics character wristwatch with the RJ x Spider-Man. 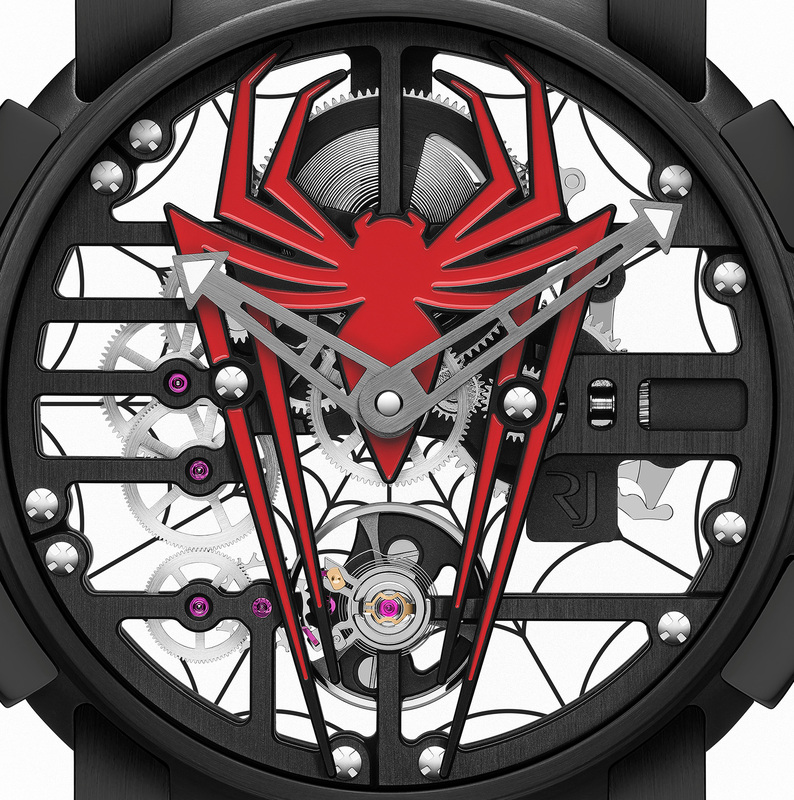 Featuring a bright red lacquered Spider-Man logo on the base plate, the watch also has a spiderweb “metallised” on the back, created by depositing metal onto the inside of the sapphire crystal back. Below the superhero logo the sits the skeletonised movement, the hand-wound RJ004-M made by by movement specialist La Joux-Perret (which is now owned by Citizen of Japan). It is characterised by linear bridges and a vertical layout, with the skeletonised barrel at 12 o’clock and balance wheel at six. The Spider-Man watch utilises the Skylab case, here in black PVD-coated steel and 48mm in diameter. The RJ x Spider-Man watch (ref. 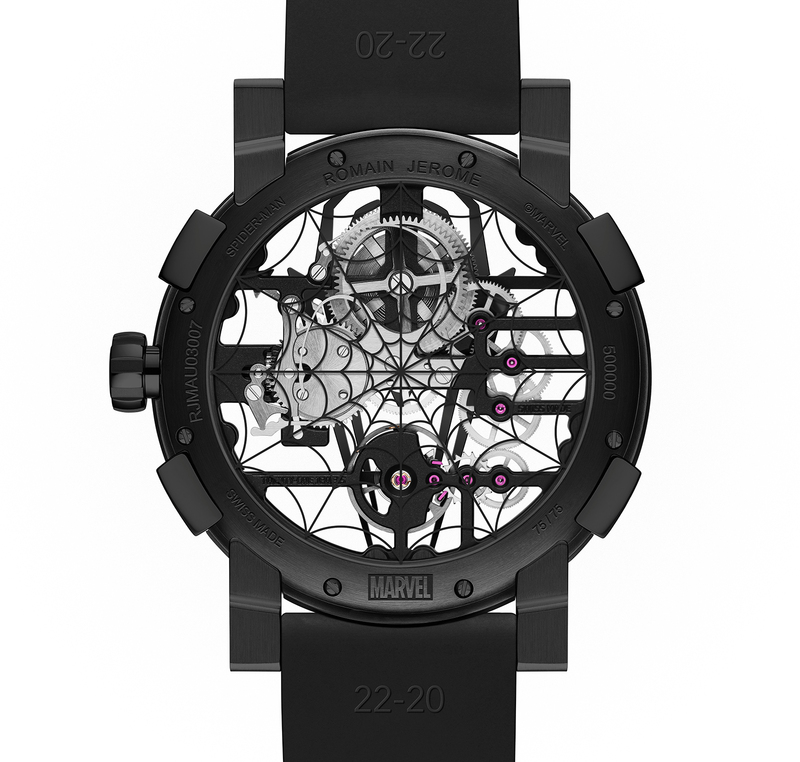 RJ.M.AU.030.07) is limited to 75 pieces and priced at SFr18,950 or US$19,500. The inevitable, as the pervasive cartoon cat makes it to the dial of a high-end wristwatch.